Until recently, 90% of the seismic acquired for the oil and gas industry has been through traditional streamer surveys. Only 10% was obtained through ocean bottom seismic (OBS), which has been struggling with inefficient technologies, static acquisitions and a limited market, all leading to higher cost, which historically has been the greatest barrier for a much wider adaptation of the technology. However, the quality of OBS data in comparison to other seismic is undisputed, and demand for full azimuth seismic is increasing, due to its improved imaging in areas with reservoir complexity, gas clouds, in pre- and sub-salt basins and for infrastructure and monitoring purposes. With major technological enhancements now being developed to overcome the traditional barriers, OBS is slowly gaining market share. Norwegian company Magseis believes that its proprietary Marine Autonomous Seismic System (MASS) is at the forefront of this technology. Magseis’ OBS acquisition using MASS is based on the principle of autonomous sensor capsules inserted into an optimized steel cable, and is therefore all about the ability to handle large amounts of equipment effectively. 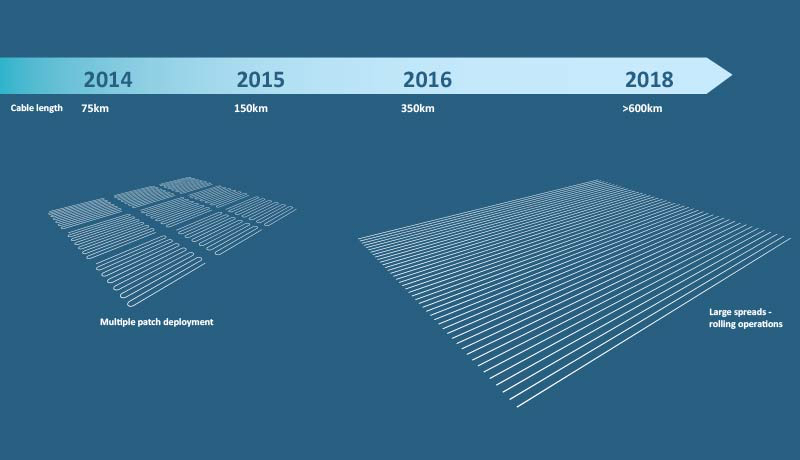 The company realized that if it could increase the number of nodes deployed on the seabed, it would be possible to dramatically increase efficiency and reduce cost. Inspired by the miniaturization of technology in the mobile phone industry, the company has developed the smallest and lightest sensor in the marketplace, which weighs a mere 8 kg, yet still provides the excellent sea floor contact needed to obtain top quality multicomponent data. With such an ultra-compact unit, there is now no limit on the number of sensors which can be deployed in any survey. In combination with fully automated handling systems and the use of robots, improved node management logistics is providing increased efficiencies, low failure rates and safer operations. Larger OBS spreads are driving substantial cost reductions. (Source: Magseis) This development is a step forward reminiscent of the way in which efficiencies in towed streamer seismic exploded when that technology moved from 2D to 3D and began towing up to 20 cables, thereby covering much larger areas than had previously been thought possible. With the MASS system the cable can be deployed and recovered at higher speeds and in much larger quantities than previously possible, so greater numbers of sensors can be placed on the seabed more efficiently than before, shortening survey times, meaning that overall productivity is dramatically increased. In tandem with the reduction in size of the nodes, there has been an increase in the size of OBS survey spreads. 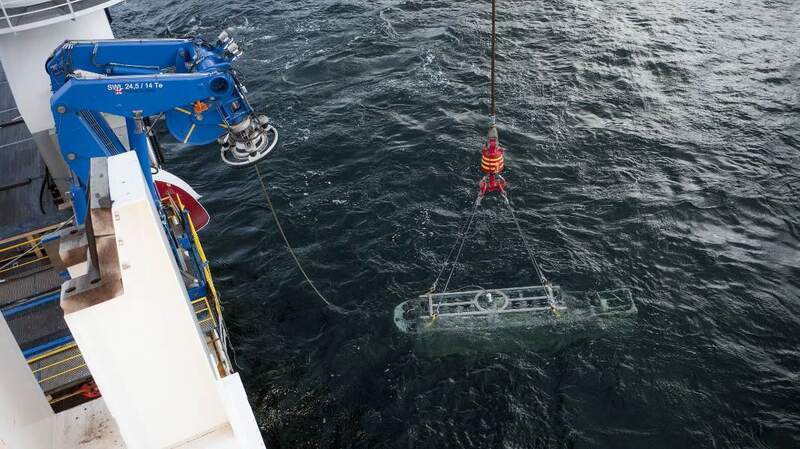 In its first commercial operation using the new nodes, for Statoil in Norway in 2013, Magseis deployed about 75 km of cable in a ‘multiple patch’ deployment, using 3,000 nodes. By comparison, it is currently operating more than 350 km of active cable in a much more efficient ‘rolling configuration’ for Saudi Aramco in the Red Sea, while preparations are ongoing for introducing its next cable crew with 600 km of cable and 6,000 nodes, to be delivered in 2018. There are further plans to increase capacity to 1,000 km of cable and 10,000 nodes. The MASS node is depth rated from 0-3,000m, which means that the same sensor can be used across all water depths. Because the node is compact and robust, it has a versatile operating platform, and can be deployed by different vehicles. To complement the large scale cable operations, Magseis has developed a modular unit. MASS Modular is a mobile and scalable set-up which maintains the fully automated handling system, by placing the robots and node management system inside offshore certified containers. This system can be fitted on to any kind of vessel and be deployed by using ROV’s or other techniques such as rope for shallow water and transition zone operations. 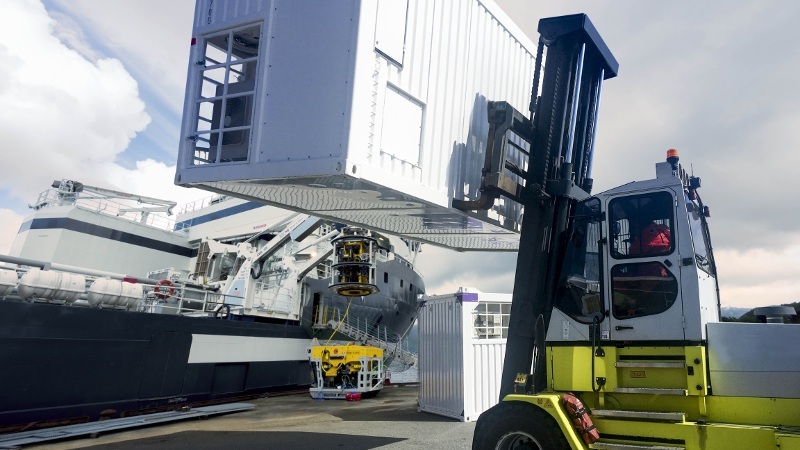 The modular MASS being lifted onboard, with an ROV in the background, between the vessel and the truck. (Source: Magseis) The company believes that the modular aspect of MASS is ground-breaking because of its full automation and scalability. The miniaturized nodes take up very little space, with 800 of them fitting into a 10 foot container, so the operation can be tailored to fit any requirement. Whether deploying a few hundred nodes in combination with a streamer survey to infill around platforms or several thousand nodes on a large scale operation, the footprint and logistics are almost identical. The modular nature of the system makes it very flexible and means that it can be sent to different corners of the world at a fraction of the cost of transiting a vessel with equipment and personnel. 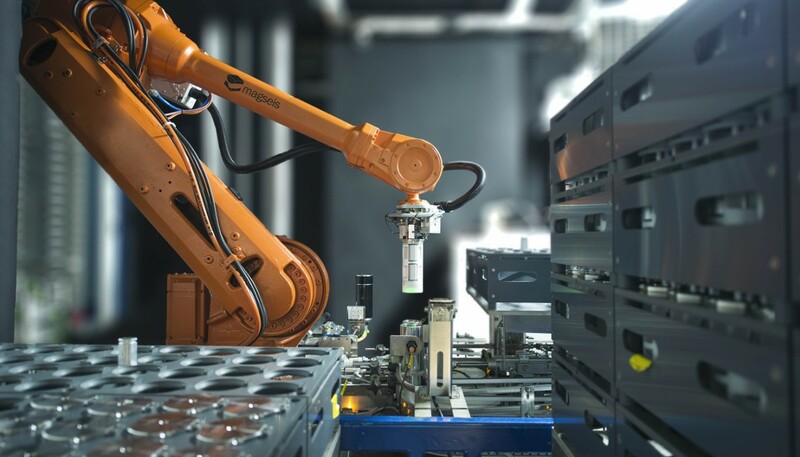 In addition, by maintaining the full automation inside only a few containers and letting the robots work like clockwork, the result is an extremely competitive portable solution. The modular system also means that it is possible to deploy the nodes, not just by cables, but also in different ways for different purposes, including using remotely operated vehicles (ROVs). Such vehicles are limited by how much weight they can carry, and so it is obvious that a lighter weight node means more of them can be deployed at a time, thus significantly increasing the efficiencies. ROV deployment is especially important within the 4D and hybrid permanent reservoirs management market, because of the positioning accuracy required for time-lapse monitoring. By using vessels of opportunity, for instance those operated by a client on a large oilfield, Magseis has identified a method of working in a smarter way with its clients in order to reduce costs. This modular system also extends to deepwater operations which have a particular reputation for being time-consuming and costly. The small and compact node sensor technology attracted Shell Technology to enter into a joint development project with Magseis for a specialized ultra-deepwater deployment vehicle with 4D positioning accuracy. The system was field-tested with great success in late summer 2016 and proved that deployment in ultra-deepwater could be revolutionized with both significantly faster placement and retrieval of nodes and increased sampling. This could be a game-changing technology which will not only compete with current OBN (Ocean Bottom Node) projects, but has the potential to overtake the large multi- and wide-azimuth towed streamer market. The full range of capabilities of the MASS system, including in deepwater, were tested earlier this year with a survey for Saudi Aramco in the Red Sea, where water depths in the survey area varied from 1,000m to the transition zone and in some cases over dry land in the form of small islands, all on the same receiver line. Despite the challenging environment and rugged seabed the survey has been executed ahead of schedule and with very high data quality. By deploying these large spreads with increased efficiencies, challenges to OBS are essentially moving away from being receiver bound to source bound. It is critical for productivity to ensure a balance between the time it takes to handle the nodes and time taken with source effort. 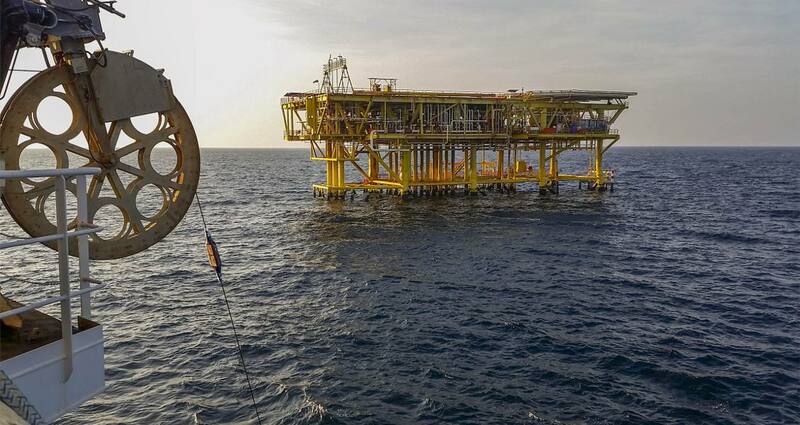 Therefore, having tackled issues surrounding the receivers involved in OBS surveys, Magseis has now turned its attention to improving efficiencies in the source technology. Earlier this year the company signed an exclusive technology agreement with Seismic Apparition GmbH, which specializes in advanced seismic data acquisition, processing and imaging services, to jointly develop and implement a new innovative technology that will reduce operational time in OBS surveys by using a technique known as source isolation. 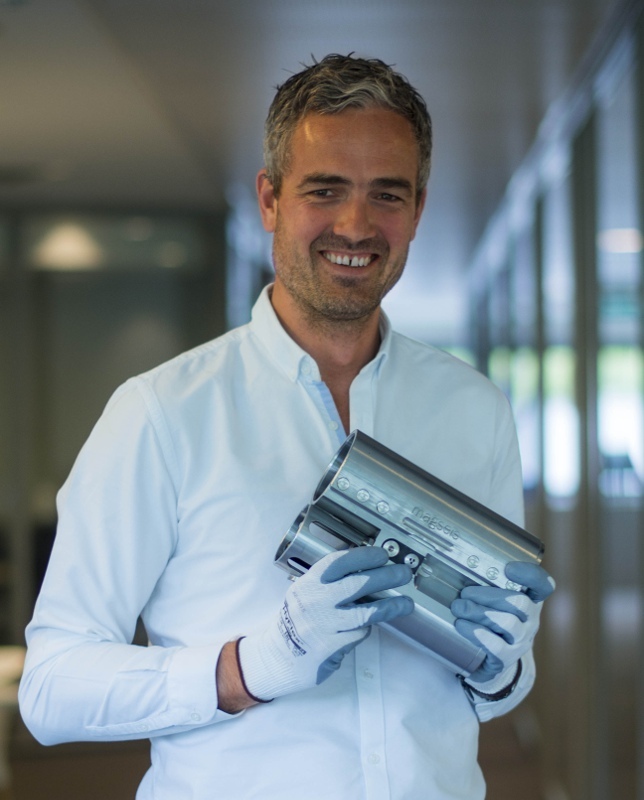 The author holding one of the ultra-compact nodes. (Source: Magseis) Unlike existing techniques which tend towards increasing the number of sources, source isolation delivers full-fold, full-length data from isolated sources by using the science of signal apparition, combined with proprietary methods for data acquisition and reconstruction, to isolate a set of quasi-parallel adjacent shots into areas that contain no signal. This unique approach addresses many of the shortfalls of conventional simultaneous or dithered source techniques, since there is no need for shots to be sequenced, and each individual source does not have to be physically distant from the others, as it works with multiple sources that are close together. This unleashes the potential for dense source spacing, which provides the same impact on cross-line sampling as tight receiver line spacing. The combination of improved source efficiency through simultaneous shooting from a single vessel, together with better source sampling when compared to conventional technologies, offers the unique prospect of acquiring reservoir quality data from efficient exploration configurations. This could result in a reduction in the cost of OBS data acquisition of 30 to 50%. Source isolation will be applicable both for reservoir 4D projects and more regional surveys. Although OBS is known to provide superior image quality, addressing cost efficiencies is vital in order for the technique to come into the mainstream. Through the development of ultra-compact nodes, a fully automated handling method with superior logistics, an efficient modular system for storage and deployment and improved source technology, Magseis believe they are enabling step-changing efficiencies in OBS acquisition. The resultant reduction in the price of OBS surveys will increase cost-competitiveness, allow for a broader range of applications, from exploration through to monitoring, and will expand the number and size of fields for which the system is applicable. So is this still a niche market? The market share for the technology has now moved to 20% and is rising steadily; perhaps ocean bottom seismic has finally become standard. Norwegian start-up company inApril explain why they took the plunge into the ocean bottom seismic market.